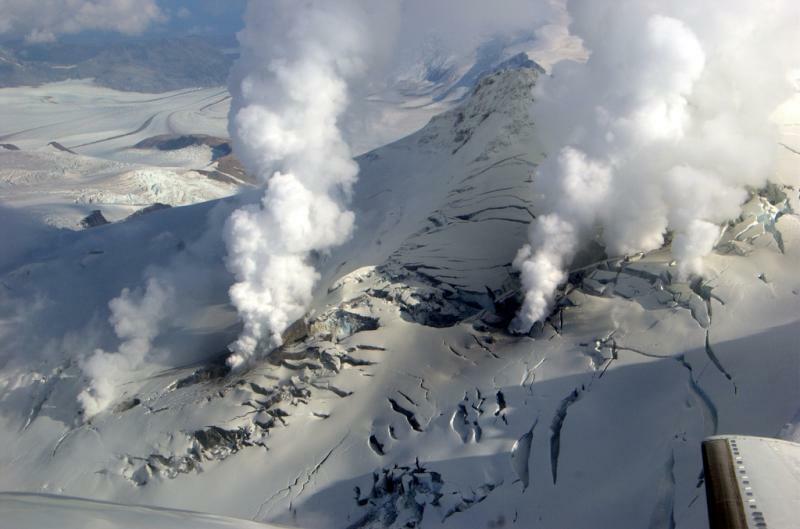 On September 17, an explosion of ash, gas, and steam from Fourpeaked Mountain 320 km (200 mi) SW of Anchorage on the Alaska Peninsula marked the onset of unrest at this long-dormant, ice-clad volcano. AVO elevated the level of concern color code to YELLOW on September 20. Since then, AVO has gathered aerial and ground-based information and also initiated installation of geophysical instrumentation to better track activity at Fourpeaked. Based on our observations and limited geologic understanding of the volcano, it is possible that significant eruptive activity could occur in the coming days to weeks. Over the weekend and continuing today, AVO flew a variety of missions to Fourpeaked volcano. The main findings are as follows: (1) Observers saw a linear series of vents running north from the summit for about 1 km (0.6 mi). Most of these vents were vigorously emitting steam and other volcanic gasses. In the immediate vicinity of the vents, the glacier had been disrupted and showed signs of subsidence. (2) Gas measurements reveal that emission rates of sulfur dioxide, hydrogren sulfide, and carbon dioxide were all high. The sulfur dioxide emission rate was roughly equivalent to that measured at Augustine before its January 2006 eruptions. A distinct sulfur smell was evident up to 50 km (30 mi) from Fourpeaked's summit. (3) Marked scouring of a glacier flowing west from the summit indicates flooding, probably from the September 17th event.